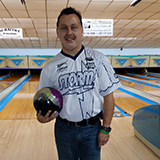 My life as a professional bowler presents many challenges including frequent travel. It includes time on planes and having to interact with many different people. Our season started this year with a three week swing beginning in Oklahoma with the Tournament of Champions and concluding with the Touring Players Championship in Columbus, Ohio. During this time, I had to interact with over 100 professional bowlers and thousands of fans. It was flu season and the potential for getting sick remained, regardless of my flu shot. I managed to stay healthy until I made match-play in Columbus. I woke up on a Thursday morning and knew I was getting the flu. It had been going around in our locker room and I tried to avoid people, diligently washing my hands—but it was to no avail. Usually when I get sick, I don’t lose my appetite, but this time was different. I was not hungry and to compound the problem, my blood glucose was averaging around 225. No matter what I tried, I could not lower it to normal levels. I was concerned because I was trying to use my correction of one unit of insulin for every 40mg of blood glucose. I also wasn’t eating and I was exercising for four hours every time I competed. It was a very hard situation to deal with. I lived on breakfast drinks because they were all I could manage to ingest and I drank lots of water. But still I went through a three day period where my blood glucose would not decrease. I was ready to go to the ER when I had an idea. I decided to use an injection instead of correcting with doses from my pump. * This seemed to work for me as my pump was delivering my basal rate and the injections were used to correct if I was high. My BG happily returned to almost normal levels on Sunday but it was too late to help me finish in a higher position. My tournament ended with a 17th place finish out of 130 players, not bad for having the flu. This situation taught me to use everything available to me to get my BG under control. And it taught me the importance of constantly checking my BG to see if it was returning to normal levels, if I over corrected or if I had more work to do. For me, diligence was the key when I was sick. *This does not reflect the standard of care for insulin administration for patients on pumps. Please consult with your healthcare team for guidance before making any changes to your diabetes treatment plan.